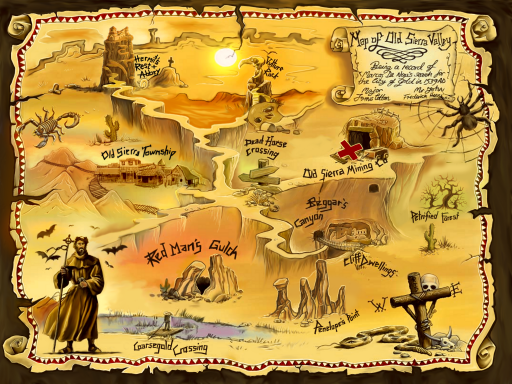 You can’t have a treasure hunt without a treasure map! But does ‘X’ really mark the spot, or is it just the beginning of ‘Rattlesnake’ Jake’s epic quest to discover the Lost City of Gold? Below that is the finished version, which reflects my suggestions for additional tweaks. The windmill and the vulture will be animated in the final in-game version of this screen. The poll results are in, and the verdict is a tie! Half of you were on “Team Big Jake,” and the other half were on “Team Small Jake.” So the winner is… “Medium-sized Jake.” I think it’s a good compromise between the two looks. Credit goes to my lovely wife for suggesting this rather obvious (to her, anyway) solution. Poll: Is Bigger Better for ‘Rattlesnake’ Jake? Which size sprite do you like best? The current Jake sprite (above left) is about 200 pixels tall. I’ve been thinking about increasing it to about 250 pixels (above right). I think it will make each scene feel more intimate, although it could also have the unwanted side effect of making the screen seem too claustrophobic. All our animations are originally rendered in Flash, so resizing him at this point is still pretty easy. Which version do you prefer? New Screenshot: No Way Out! One thing that’s bothered me from the moment I decided to split Rise of the Hidden Sun into four parts is that the first episode is quite a bit shorter than the subsequent ones. It’s more of a set up to the main action than anything else, in much the same way that the opening sequence of an Indiana Jones movie is different than the primary quest. This location sketch here is for a new area called “The Old Sierra Burying Ground.” This is not a final screen, but it’s close enough that I thought I’d share it. I’m really happy with how it’s turning out. I’ll post the final pencil art version when it’s completed, along with some notes about what we changed, and why. Here’s a sneak peek at Rise of the Hidden Sun‘s very first in-game animation sequence: ‘Rattlesnake’ Jake arriving at the crossroads, wiping his brow, and checking the old treasure map to make sure he’s in the right place. For anyone curious about the technical aspects, we’re producing all of the animations at 16 frames per second. This particular arrival sequence is about 14 seconds long. UPDATE: Watch the rough cut of this animation here.